One year-and- eight days already passed since a 7.0 magnitude earthquake hit the most important part of Haiti. This horrible earthquake took away over 300, 000 lives, left over 1.5 million homeless and several thousands injured. Ten months after this tragedy a Cholera outbreak discovered. UN is accused. This deadly cholera already sent over a thousand people to death and several thousands to hospital. Seemingly, the Haiti's former dictator Jean-Claude Duvalier took advantage of the terrible and inhumane situation, and chose to return to the country. It was told that Mr. " Baby Dictator" received his diplomatic passport under the defacto regime Boniface Alexandre/Gerard Latortue, a regime fully backed by Washington at that time. Why Mr. Dictator did not make it back in 2005 or whatever the time he received it? Mr. 'Dictator' brutally ruled the country for 15 years after his father 's death. The question is, why cannot former democratically elected President Aristide, a victim of the 2004 coup d'etat obtain his diplomatic passport to return to his country or to go to a country where he can receive the care he needs for his health? It is a way that the coup organizers and executors use to slowly kill him? The health of former President Aristide is now a human rights concern. Right to health care is one of the rights that President Aristide has as human. Former President Aristide was forced to leave Haiti. His return should be conditioned. how can a dictator come back to his country, perhaps, one of his victims cannot? Mr. Duvalier left Haiti in 1986 with millions of dollars and let thousands of people with tears. Now he is in Haiti, the Haiti's justice system made a an important step on January 17th to prosecute him. Haitian people deserve justice, and justice must be given to all victims of the Duvalier's regime. Meanwhile, President Aristide has been asking for a diplomatic passport for several years. He still cannot obtain it. President's supporters have been asking for his return since the day after the coup d'etat. But they have been asking for all coup leaders like Louis Jodel chamblain, Guy Phillipes along with "Mr. Baby Doc' to be take to the court. The return of President Aristide is today imminent, not only because he legally has to come back to his homeland, but also his health condition necessitates this return. He would be shameful to have a democratic President constraints to reserve the care that his health necessitates while assassins, murders and criminals are freed to walk on the streets teasing their victims like nothing had ever happened. "There is reconciliation without justice," said Haitian famous Agronomist Journalist Jean-Leopold Dominique. Time is come to render justice to the thirty of justice. Time is come to judge the criminals and to send a clear message to those who intend to commit the same criminal acts as did the Duvalier regime. Haiti has suffering for a long time. Haiti's suffering started back from the day of its independence. United States, France and Canada along with the Haitian elite, who see only their own economic-interest by destroying the masses, or make them poorer that they had never been before. As know on December 16, 1990 Haitian said no to dictatorship and military regimes that ruled this country for a long amount of times. But seven month after the democratically elected President Jean-Bertrand Aristide got into office, a coup ousted him. This Coup d'etat was backed up by United States/ CIA , the Haitian elite and the Haitian former army as the executor of this coup. Resistance of Haitian people defeated this coup d'etat. on October 15, 1994 "Titid" came back, and he organized democratic elections and made the first peaceful transitional power in the history of Haiti. After the celebration of Haiti's hundredth Independence, Another coup d'etat was already on its way. And this this time it was curried by a special US commando. The February 24 coup was the worst political coup in Haiti's history because it was the time that the country was trying to ride the democratic and economic bus. In 2006, again people's resistance defeated the coup by electing Preval at the head of the country. President Preval normally has betrayed them. Still, they want to get ride of him in a democratic way, which is inclusive, fair and just elections. But, not the one OAS, UN, CARICOM cautioned last November 28. 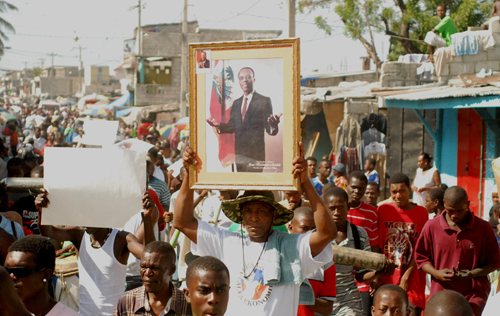 Haitian demand for new fair, just and inclusive elections, not flawed elections. Less than 70% of the Haiti's population went to vote on November 28, 2010. As many political, economical and sociological experts acknowledge or can argue, progress cannot be made where there is political instabilities, and where injustice is the rule. Below is a letter from first former Haiti's democratically elected President Aristide from his exile describing the state of his health. Special thank to Ezili's Haitian Lawyers Leadership Network who shares this letter with us. in order to reduce any risk of further complications and blindness. make that happen in the next coming days. our sincere gratitude to the government and the people of South Africa.